1000Bulbs.com extends their foray into NASCAR with the 1000Bulbs.com 500 on October 14. The playoff event at the pressure-packed Talladega Superspeedway is the second race in the Round of 12 for the Monster Energy Cup Series. Featured in movies and songs, the Talladega Superspeedway is well known as the longest track in NASCAR. The track’s reputation for thrilling races and fan-friendly activities coincides with 1000Bulbs’ own commitment to innovation and excellent customer service. The 1000Bulbs.com 500 builds on the company’s steadily growing involvement in the world of NASCAR. This season the world’s largest online lighting retailer is also the primary sponsor of four races for 2013 Talladega winner, David Ragan and his Front Row Motorsports’ No. 38 Ford. The 1000Bulbs.com 500 brings speed and skill to high point as the second playoff race in the Round of 12 for NASCAR’s premier series. The weekend will also feature the Talladega 250 for the NASCAR Camping World Truck Series on Saturday. 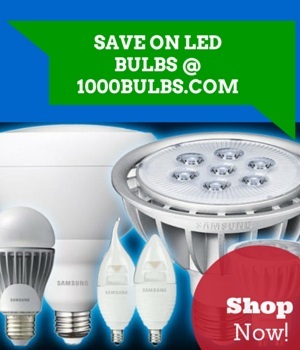 For more information and updates, visit www.facebook.com/1000bulbs. Talladega Superspeedway is NASCAR’s Most Competitive (record 88 lead changes in 188 laps), highest banked (33 degrees), and longest track (2.66-miles), as well as the most fun and fan-friendly. Talladega offers something for everyone, including hundreds of acres of free camping, amazing kids’ tickets and college student prices, along with special offers for military members, first responders as well as teachers and educators. The historic venue, built in 1969, features the traditional Saturday Night Concert and the world-renowned Talladega Blvd, home of Friday night’s “Big One on the Blvd” party. It’s the site of the most comfortable seats in motorsports, large ISM Vision HD video boards lining the frontstretch and endless pre-race activities for fans on race day, including special kids’ VIP opportunities. Talladega’s spring 2018 triple-header race weekend is set for April 27-29 and its fall event weekend, featuring the 1000Bulbs.com 500, is October 13-14. For more information, go to talladegasuperspeedway.com or call the Talladega Ticket Office at 855-518-RACE (7223).